BETWEEN LIGHT AND DARKNESS // 2010. 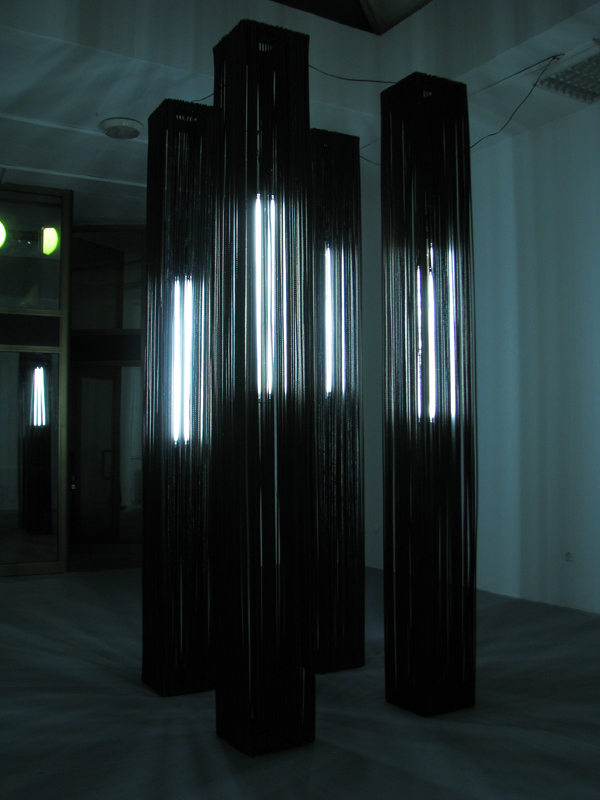 The installation is constructed of four monoliths, vertical raster’s that captivate light enshrined within. It, the light, attempts to annihilate the imposed boundaries by breaking outside the limited space. The contrast between dark cables and the light creates an illusion of captured universal being. It penetrates a new, outer space, continuing its movements and existence despite the imposed limitations. The cells (Monoliths) have a double function: to limit and to edit. The light alludes to an exit, and while being dispersed throughout the space it generates numerous rays that, in turn, create vertical shadows (Codes). The light is Being's performance; in different cultures it symbolizes enlightenment, it is the sustainer of life, main force in the universe that everything begins and ends with. The lightness and darkness, day and night signify binary oppositions and alternate virtues. EXHIBITED // Gallery Duplex10m2 // 2010. BETWEEN LIGHT AND DARKNESS from NELA HASANBEGOVIC on Vimeo.